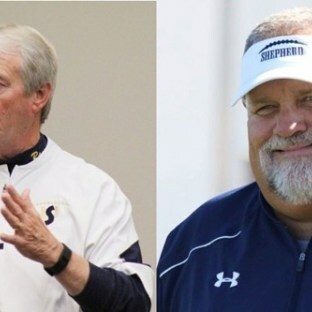 SHEPHERDSTOWN, W.Va. –– Shepherd University vice president for athletics Chauncey Winbush announced Wednesday that head football coach Monte Cater is retiring. Additionally, Winbush announced that longtime assistant coach Ernie McCook will take over the head coaching duties. Cater has amassed a 245-93-1 (.724) record in his 31 years as head coach at Shepherd. He was the winningest active NCAA (all levels) football coach at the time of his retirement with 274 career victories. Cater led the Rams to 17 conference titles (1988, 1991, 1992, 1994, 1997, 1998, 1999, 2004, 2005, 2006, 2007, 2010, 2012, 2013, 2015, 2016, 2017) and 13 postseason appearances (1991, 1992, 1998, 1999, 2005, 2006, 2007, 2010, 2012, 2013, 2015, 2016, 2017). Shepherd had six undefeated regular seasons (2005, 2006, 2013, 2015, 2016, 2017) under Cater. He is the all-time winningest football coach in WVIAC and MEC history. His 245 wins at Shepherd are the most by any collegiate football coach at a college or university in West Virginia. The Rams won three Super Region One titles (2010, 2015, 2016) under Cater and were national finalists in 2015. Shepherd won the Division II Lambert Award in 2015 and 2016. The award is symbolic of supremacy in Eastern college football. Cater garnered Vince Lombardi Foundation Coach of the Year honors in 2016. The award encompasses all divisions and is not given on a yearly basis. McCook takes over the coaching reins after serving as an assistant at Shepherd for 18 years. He served as offensive coordinator for nine years and was offensive line coach for 10 years for Shepherd from 1999-2008. McCook was elevated to assistant head coach in 2007. He spent the 2009 season as running game coordinator/tight ends coach at Liberty University before returning to Shepherd the next season. McCook served as assistant head coach/offensive coordinator at Shepherd since 2010. McCook has been instrumental in the development of several standouts players at Shepherd including Rimington Award winner Ryan Pope, All-American linemen Isaiah Shelton and Lavonte Hights, All-American running backs Damian Beane, Dalevon Smith, and Dervon Wallace, quarterbacks Dan Chelbowski, Jeff Ziemba, and Connor Jessop, as well as a pair of All-Americans in tight end Dominique Jones and wide receiver Billy Brown. Prior to Shepherd, McCook served as an assistant at Frostburg State University. McCook also had coaching stints at Wesley College and Susquehanna University. McCook, a 1992 Wesley graduate, was an offensive lineman for the Wolverines. He gained a master’s degree in sport science-sport management from the United States Sports Academy in 1999. Next Article Kansas basketball: Bill Self is trying something he's never done to help Devonte Graham. Is it enough?